In this article, you will learn about virtual function and where to use it. Also, you will learn about pure virtual function and abstract class. Before going into detail, let's build an intuition on why virtual functions are needed in the first place. Let us assume, we are working on a game (weapons specifically). We created the Weapon class and derived two classes Bomb and Gun to load features of respective weapons. However, our game project started getting bigger and bigger. And, we decided to create a separate Loader class to load weapon features. This Loader class loads additional features of a weapon depending on which weapon is selected. The loadFeatures() loads the feature of a specific weapon. Our implementation seemed correct. However, weapon features was loaded 4 times. Why? Initially, the Weapon object w is pointing to the b object (of Bomb) class. And, we tried to load the features of Bomb object by passing it to loadFeatures() function using l object to pointer (of Loader class). Similarly, we tried to load the features of Gun object. That's the reason weapon features are loaded 4 times. To solve this issue, we need to make function of base class (Weapon class) virtual using virtual keyword. Also, notice that, the l->loadFeatures(w) function calls the function of different classes depending upon what l object is pointing. Using virtual function made our code not only clearer but flexible too. In the above program, weapon features is printed twice. We encourage you to add additional code on the above program to load weapon features only once. If we want to add another weapon (let's say knife), we can easily add and load features of it. How? It's worth noticing that we didn't change anything in the Loader class to load features of knife. The goal of object-oriented programming is to divide a complex problem into small sets. This helps understand and work with problem in an efficient way. Sometimes, it's desirable to use inheritance just for the case of better visualization of the problem. In C++, you can create an abstract class that cannot be instantiated (you cannot create object of that class). However, you can derive a class from it and instantiate object of the derived class. Abstract classes are the base class which cannot be instantiated. A class containing pure virtual function is known as abstract class. And, the class Weapon is an abstract class. In this program, pure virtual function virtual float area() = 0; is defined inside the Shape class. One important thing to note is that, you should override the pure virtual function of the base class in the derived class. 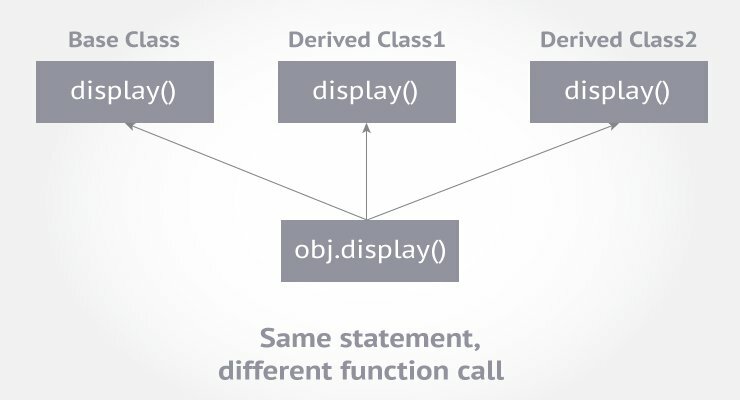 If you fail the override it, the derived class will become an abstract class as well.